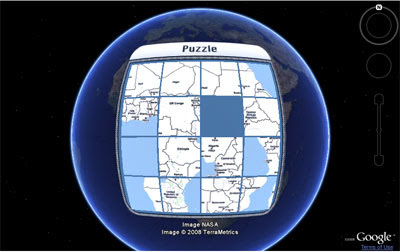 Google have added this slide puzzle game to their demo gallery for the Google Earth browser API. The game involves trying to recreate a jumbled up map of Africa. Many of you will remember the driving directions that Google used to give from Sydney Airport to Newington College that suggested that you kayaked from the USA to Australia (Google Maps Mania post). That route has now been fixed by Google defaulting to Sydney, Australia now for Sydney Airport, rather than the Sydney Airport in Canada. However a Google Maps Mania reader has found that if you ask for driving directions from Launceston to Hobart you are again asked to kayak across the Pacific Ocean. At least this time Google tries to break up your kayaking journey a little by diverting you via Japan and Hawaii. Even so you still have a 5000 km kayak from Australia to Japan, then a 6000km journey by kayak to Hawaii and finally another 4500 kayak to mainland USA. All-in-all Google thinks the journey will take you 56 days and 3 hours. According to this picture the 'new' trend seems to be revolving around Google Maps. In Australia the figures certainly back this up. 'Google Maps' is the third fastest rising search term on Google this year. I think this might have a lot to do with the launch of Street View in Australia. Since the launch in August searches on Google by Australians for Street View increased by over 5000%. This giant spider was found by Google Sightseeing. 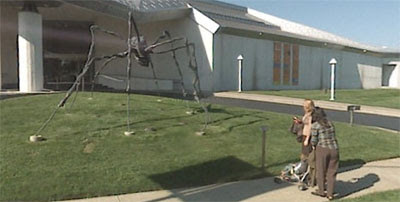 The spider is actually one of Louise Bourgeois' famous sculptures.